Its sheer number of nicknames indicate just how beloved it is and its frequent onscreen occurrences, from "Austin Powers" to "Mad Max," further highlight its celebrity. Beetle is the pop star of the Volkswagen lineup and if you've never sat in the driver seat of one, now's a better time than ever to do so. 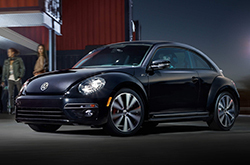 The 2016 VW Beetle in Orlando offers an array of exciting updates for new car shoppers. It gains the latest MIB II infotainment system, a revised trim lineup, new Denim and Dune special editions, and four new exterior paint colors: Silk Blue, Habanero Orange, Dark Bronze and Sandstorm Yellow. Two primary grades are available, 1.8T and R-Line, which get three trim levels - S, SE and SEL. All 1.8T designated models come standard with a 1.8-liter turbo four-cylinder that achieves an impressive 170 hp and EPA-estimated 28 mpg combined (25 city/34 highway). R-Line models get a more powerful 2.0-liter turbocharged engine that produces 210 hp, while still achieving good fuel estimates: 23 city/31 highway mpg with the dual-clutch automatic and 24 city/31 highway mpg with the manual gearbox. In Edmunds.com's 2016 Volkswagen Beetle review, editors declare that they're fond of both engines. If you're not sure which is right for you, try out each to see which suits you best. In addition to the aforementioned trim levels, the fashion-forward Beetle is offered in a couple of new special editions this year. 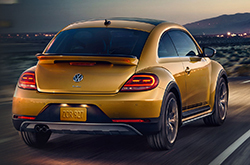 The 2016 Beetle Denim is a great pick for Orlando drivers who are familiar with the 1970s Beetle Jeans model, which the new Denim convertible pays tribute to. This special edition includes a unique textured top that looks like denim, a light blue and silver dashpad, jeans-inspired seat pockets, and denim-colored upholstery with dark blue leatherette accents and white piping. Exterior paint colors for the Denim include Pure White and Stonewashed Blue. The Dune is another great selection for anyone purchasing a 2016 VW Beetle in Orlando, Florida. Its desert-inspired name hints at its sporty look and fun selection of paint colors. The Dune gets increased ground clearance as well as exclusive side moldings, wheel designs and bumpers. Its exterior color palette includes Sandstorm Yellow, Pure White and Deep Black Pearl. Learn more about the renowned love Bug in the continuation of Camelback VW's 2016 Volkswagen Beetle review below. If you've ever thought about purchasing vehicles like the 2016 Fiat 500 and the Mini Cooper in Orlando, compare Volkswagen's new 2016 Beetle first; we're positive that it's the right fit for you. Just a few of the characteristics that shoppers in FL will appreciate are the Beetle's pronounced looks and competitive cost. Compare its price to the aforementioned vehicles and you'll see that it's a remarkable value, which is one of the main reasons why so many Orlando drivers select it. The bullet list under this paragraph will give you even more info about its specs! 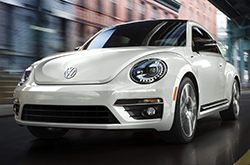 We take the time to put together reviews of the 2016 Beetle and other Volkswagen models because we want to help make your vehicle search a breeze. It's difficult to find hard facts about a wide array of cars in one spot. That's why it's OUR duty to offer reviews from expert auto critics, so you have access to these information sources on one site. Make good decisions when it comes to your next auto purchase - don't take guesses! Each summary is filled with data and vehicle features in a clear format that's easy to understand. Find out more about David Maus Volkswagen South's incredible lineup! 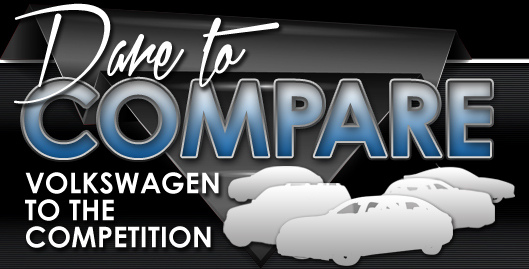 Review and compare Volkswagen other vehicles in our digital research directory now!